We usually look to success and experience for inspiration, but once in a rare while we can be inspired by failure and inexperience. If character is sometimes defined by how we react to failure, then 21-year old Rory McIlroy is an inspiration, a man of real character. McIlroy was on the verge of claiming one of sport’s greatest awards, the green jacket and the $1,440,000 that goes to the winner of golf’s Masters tournament. He had a four-stroke lead going into the last round, and a one-stroke lead with nine holes to play. Then disaster: a triple-bogey 7 on 10, a bogey 5 on 11, and a double-bogey 5 on 12 and McIlroy was out of contention, finishing with a score of 80 and a tie for 15th place. Walking off the 18th green he was met by a sportscaster with a microphone. McIlroy didn’t run from the mike. CBS reporter Peter Kostis asked what happened. McIlroy didn’t whine, didn’t complain, didn’t offer an excuse. McIlroy already has more than a little bit of character. This entry was posted on April 11, 2011 at 11:02 pm and is filed under Ethics-general, Sports. You can follow any responses to this entry through the RSS 2.0 feed. You can leave a response, or trackback from your own site. This was a really good post on a number of levels. It seems we are a culture, in my opinion, that is obsessed with winning. We live vicariously through the triumphs of others. Be it celebrities, sports heroes, politicians etc. I know that as a Tiger Woods fan I was rooting against Mcllroy, and even saying derisive things about him at the screen to jinx him. Now I realize that I was so caught up in the competition that by demonizing him, I was not only doing Mcllroy a disservice, but myself as well. Sports is really a chance not only to be entertained as a partisan advocate ( for whatever team or individual we prefer), it is also an opportunity to celebrate our humanity.Losers define the competition as much as winners and sometimes the vulnerability of those who fail and the grace they demonstrate, is a different kind of triumph. One that with its grace is a laudable as the excellence and dedication demonstrated by victory. 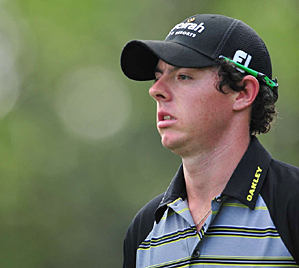 Incidentally, re McIlroy’s being a loser. I did some research on him and learned he’s quite a remarkable 21-yr old: he’s earned over $6 million, finished tied for 3d in the PGA twice, at 19 and 20. He could be one of the best.